The White House has announced that a second summit between U.S. President Donald Trump and North Korean leader Kim Jong-un will be held at the end of February, at a place to be announced "at a later date." 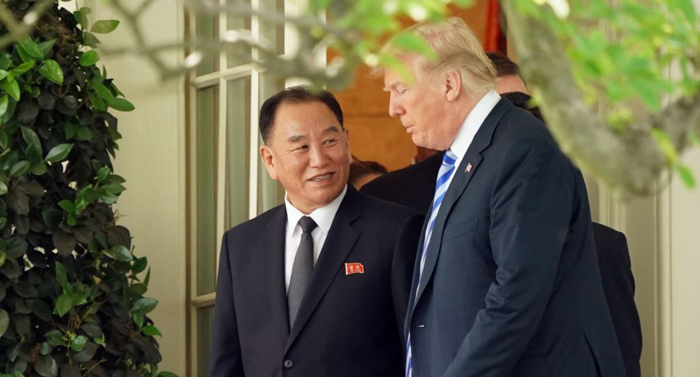 The announcement was made after Trump met Friday with Kim Yong-chol, North Korea's top nuclear envoy in the Oval Office, which the White House said was to "discuss efforts to get Pyongyang to give up its nuclear program." Trump's meeting with the former North Korean spymaster, who often is referred to as Kim Jong-un's right-hand man, lasted 90 minutes. After the meeting, Press Secretary Sarah Sanders told reporters the administration is continuing "to make progress" on this front. Earlier on Friday, Kim Yong-chol met with Secretary of State Mike Pompeo at a Washington hotel. The meeting's aim was to revive nuclear negotiations, which have been postponed for months over what U.S. officials say is Pyongyang's refusal to meet Washington's demand for a detailed inventory of its nuclear and missile programs. On several occasions Trump has expressed his confidence about North Korean denuclearization. "With North Korea, we have a very good dialogue," the president said on Jan. 6, adding that it's "very special" and that with "anybody else but me, you'd be in war right now." At the United Nations on Friday, UN Secretary-General Antonio Guterres encouraged both countries to continue talks. "We believe it's high time to make sure the negotiations between the United States and the Democratic People's Republic of Korea start again seriously and that a road map is clearly defined for the denuclearization of the Korean Peninsula," Guterres told reporters. "We won't advocate for any anticipation of other measures before a clear negotiation is put in place, aiming at denuclearization of the Korean Peninsula with a road map."